Holley has announced the release of its all-new Terminator X and Terminator X Max electronic fuel-injections systems. Developed specifically for LS engines and available in 12 different variations, they’re superior to ordinary stand-alone LS engine-management systems and compatible with numerous applications for less than $1000. They put an end to unwieldy aftermarket tuning interfaces and provide plug-and-play self-learning fuel strategies and proven, race-winning Holley EFI technology. 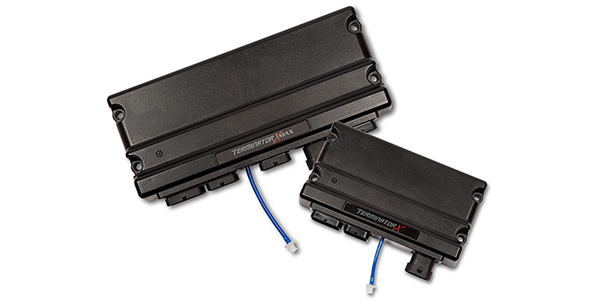 Terminator X features real-time fuel learning, high-impedance injector drivers, an integrated 1-bar MAP sensor, and four programmable inputs and outputs ideal for electric fans, boost-control solenoids, progressive nitrous control, and more. Terminator X Max does all that and also delivers single-drive-by-wire throttle body control and electronic transmission control. The included 3.5-inch handheld LCD touchscreen comes with an easy-to-use calibration wizard along with tuning and gauge-display functions. All Terminator X systems come fully loaded with base maps for common LS engine combinations that get you out of the garage and out on the road or racetrack in no time. Either way, you get Holley EFI’s industry-leading, intuitive software suite that provides full laptop access for advanced users. All Terminator X systems use Bosch LSU 4.9 wideband to relay AFR information to the ECU for accurate reading and precise tuning control. These systems are compatible with virtually all Holley EFI accessories – analog-style gauges, shift lights, numerous modules, and digital dashes, among others – and are perfect from one end of the spectrum to the other, from budget-beater street machines to all-out boosted race cars, with all the features and technology you need at a price that’s better than you’d expect. RMC Engine Rebuilding Equipment Inc.